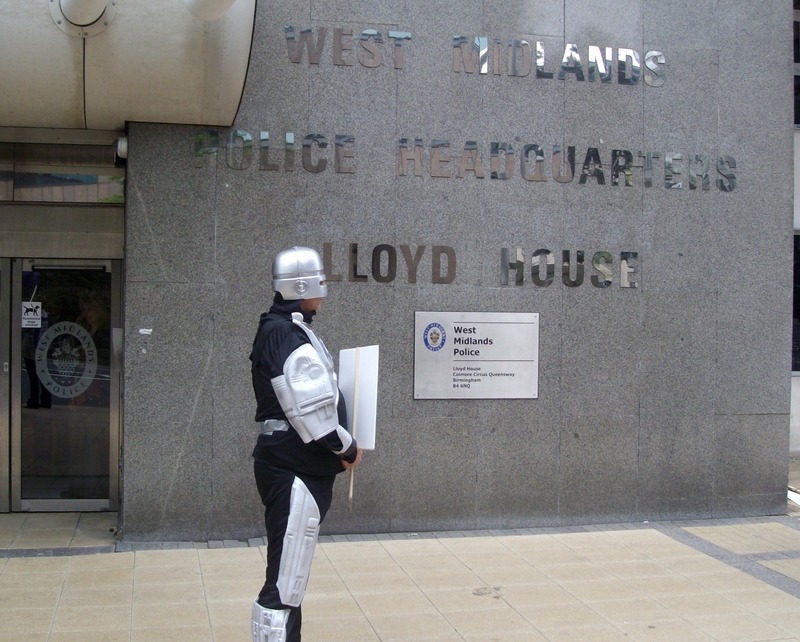 West Midlands Police Authority met yesterday in the wake of the G4S’s Olympic debacle leading the newspaper headlines and the consequences being debated in Parliament. Cllr Bob Jones the Labour candidate for the Police and Crime Commissioner (PCC) arrived outside Lloyd House presenting himself to the TV cameras in front of the mass lobby against the privatisation led by UNISON and Unite. At the beginning of the meeting members of the public repeatedly challenged Bishop Webley, Chair of the Police Authority, over the exclusion of public questions relating to the human rights records of the shortlisted companies for the BPP. The meeting considered the belated Business Proposal for the Business Partnering for Policing. The advocates for the privatisation focused on the need to update the IT systems of West Midlands Police with private investment. Cllr Bob Jones claimed the BPP “is already a car crash, let’s not drive a juggernaut into it!” In the debate Jones acknowledged concerns about the bidders and said that if he became PCC he would not accept any companies on the shortlist who were in breach of international law. Independent member, Zahid Nawaz warned that public perception of the privatisation could not be ignored. The meeting voted to accept the Business case for the BPP by 8 votes with 7 members abstaining; this included the Labour Group and some independent members. The Labour Group abstained on the basis that the decision should be left to incoming PCC. News of Surrey Police Authorities decision to suspend its involvement in the BPP arrived by Blackberry, the Surrey meeting took place earlier on Thursday morning. This led to Cllr Jones proposing a motion to defer consideration of the procurement timetable due to confusion about the uncertainty and the implications of Surrey’s decision for the partnership arrangement. The Police Authority voted by 8 votes to 7 ‘not make any further Gateway decisions’. The West Midlands Police Authority decided to defer any decision of the selection of partners until the election of the Police and Crime Commissioner in November. “Work will continue on the West Midlands programme so the new PCC (Police and Crime Commissioner) has a range of options when he or she takes office. This is a victory for tactical manoeuvring not a principled defeat of privatisation. The meeting decided that preparation for the procurement process would continue. Although the Tory and Labour candidates for the PCC have declared themselves opposed to the BPP programme they have not declared themselves opposed to privatisation. 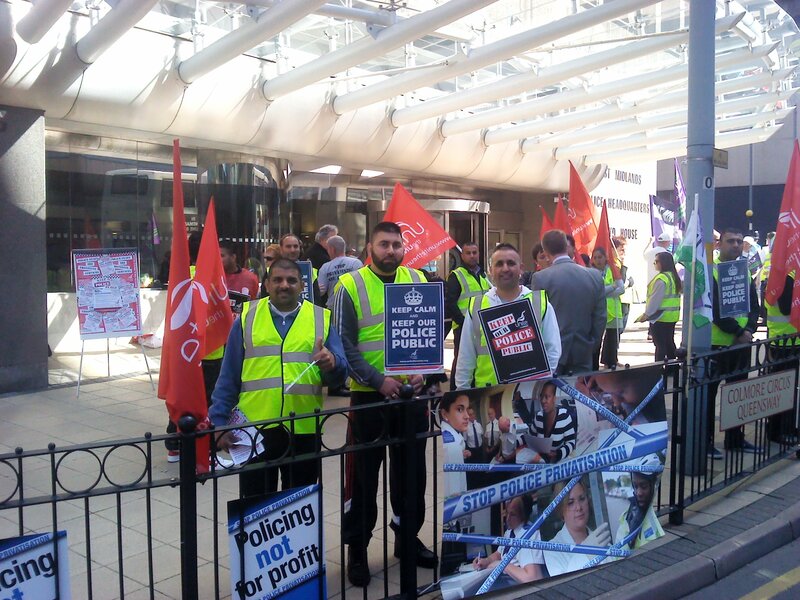 Unite and Unison members working for West Midlands police held a demonstration today, in advance of lobbying the police authority over the planned privatisation of West Midlands Police, which will see not just the support and administration side of the police put out to tender, but also responsibilities for patrolling streets, investigating crimes and detaining suspects. Companies like G4S, Serco and KBR are in line for taking over front line policing duties. Update: Surrey Police, who were also planning to privatise parts of their force along with West Mids Police, has decided not to go forward with the plans. We hope that West Mids Police will follow. 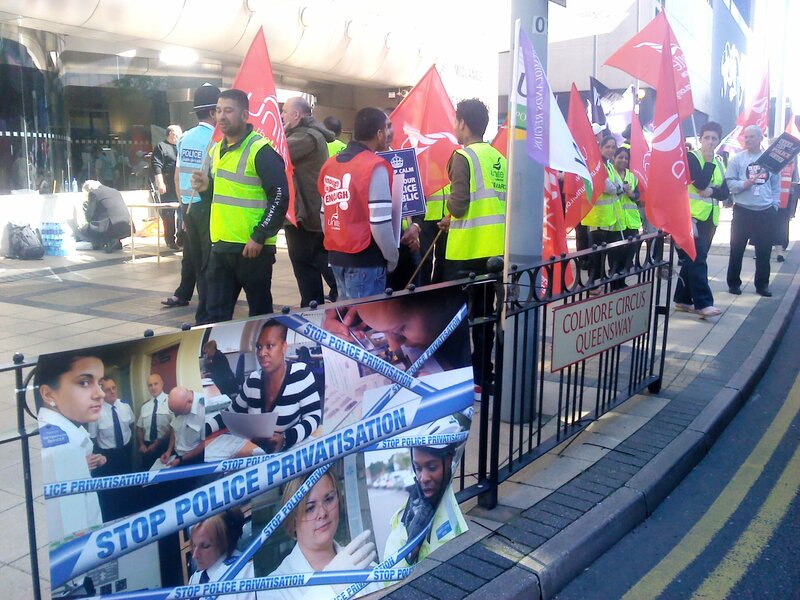 At the demonstration, concerns were spoken about the impact privatisation of policing services would have on both civilian staff and on members of the public when they find themselves in need of the police. We believe the police services everywhere in the country should not be privatised, a lot of public sector services have gone to the private sector but due to reasons of accountability we think it would be inappropriate to privatise the police services. We’ve seen in the past with services being privatised we’ve seen reductions in the quality of terms and conditions of employment and usually job losses as well. We believe the police services will be alot worse, a lot of the functions are carried out by civilians and some of those services will be done for profit and the only way they can make profit is to reduce what they are doing. Any private sector company which comes into giving out public service is fundamentally in there to get profit out of it. On the staff it will have a real impact on their terms and conditions, I also think that we’ll lose a lot of experience, a lot of the staff we have actually work for the police for the pros of working for the police and giving a service to the West Midlands, unfortunately if the private sector come in, they have not got the training or mentality that public sector staff have got. Our concerns are that the public will not get the same service they are getting today, any company that comes in, we’ve seen it with G4S in Lincolnshire, they came in and cut staff which is obviously going to have a major impact on the public. 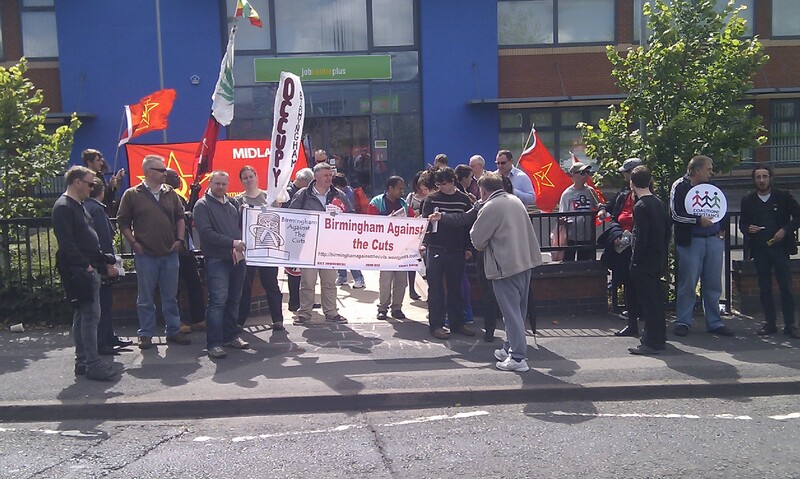 Particular concerns were raised about the main bidders for the contract – G4S and KBR. G4S have been responsible for many deaths in custody, including Jimmy Mubenga. Just today we have found out that the company are so incompetent that they have failed to hire and train enough security staff for the Olympics, despite having had 7 years to plan for the games. KBR, part of Halliburton, helped build Guantanamo Bay, and have been complicit in other human rights abuses. In 2011, it was revealed that Serco used taxi’s to transport prisoners to court after it’s computer systems failed. The huge cost of the taxis was of course picked up by the taxpayer. You can find out more about the planned privatisation and why we oppose it by clicking here for a briefing on the plans. There are 3 events happening next week in Birmingham – on Monday, we have our monthly meeting, with Tom talking about the case for a new generation of social housing. 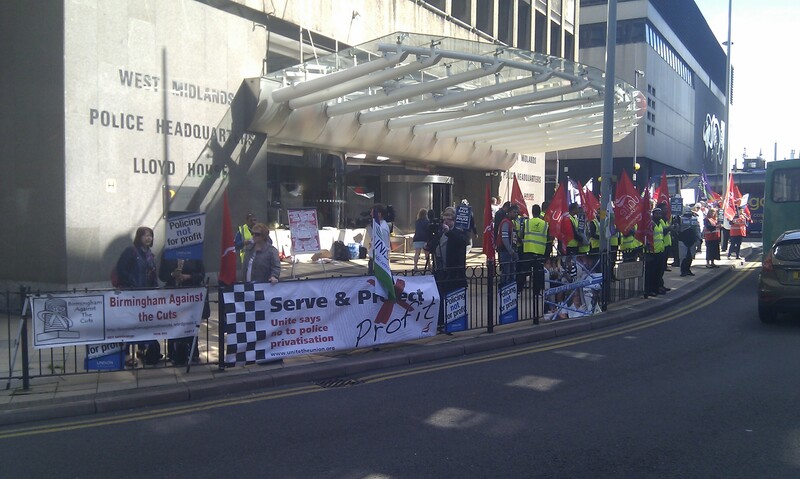 Tuesday is a welfare and workfare conference and on Thursday there is a lobby against the privatisation of the police. If you think you’ll fancy a night out at the end of that, there’s a Spanish miner solidarity gig happening on Friday at the Birmingham Social Centre. 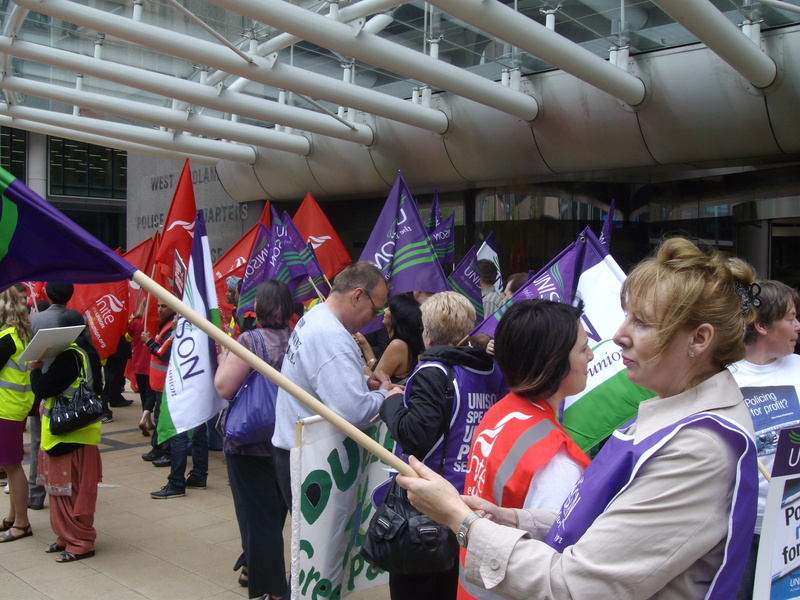 So first up is our meeting – 6:30pm on Monday, at Unison offices, 19th floor, McClaren Tower, Priory Queensway, B4 7LR. Tom will be talking about the case for a new generation of social housing, how it can form part of the alternatives to cuts, prevent the need for cuts to housing benefits directly and what plans there are in Birmingham. This will be followed by a discussion about housing issues, and what we can do in Birmingham. 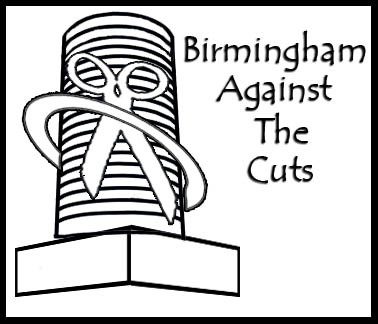 That’ll be for around an hour, and then there will be about 30 minutes of organisational matters relating to anti-cuts activities in Birmingham. Then on Tuesday is a one-day conference on welfare issues, organised by Boycott Workfare, but covering more welfare issues than just workfare. Running from 9:30am – 5:30pm at Unite the Union, 211 Broad Street, Birmingham, B15 2AY, the conference is free and you do not need to book – just turn up for the day or whichever sessions you can make. The full timetable is available here. This conference is particularly important given recent events where a man set himself on fire outside Selly Oak job centre, after desperation set in following problems with benefit payments, and the news that a Birmingham man who suffered from a heart condition died of a heart attack just weeks after being found fit for work by ATOS. This morning, Holland and Barrett announced that they were pulling out of the Work Experience Scheme, after sustained demonstrations at their premises, led by Solidarity Federation branches around the UK. In their statement, Holland and Barrett said that the protests were the main reason they would be leaving the scheme. They are instead going to be taking people as apprentices – paying just £2.60/hour, far below the living wage in Birmingham of £7.20/hour. A step in the right direction, and to be celebrated as a victory – Holland and Barrett were singled out by Chris Grayling as a shining example of firms taking workfare labour from the taxpayer, so them leaving the scheme is a big blow for this Government. We must watch to make sure they are not still taking part in other workfare schemes like mandatory work activity, and we must be clear that £2.60/hour is not an acceptable wage. This shows that demonstrations and protests do work, and that we can bring pressure to bear on companies and through them the government. Thursday is the lobby of the Police authority against the privatisation of policing services, including investigative roles. We do not want to see the likes of G4S and KBR patrolling our streets. For a briefing about the privatisaion, explaining why it should not take place, click here. Then on Friday, a night out in solidarity with Spanish miners who are facing the destruction of their communities in a similar way to how our miners did in the 1980s. As part of the Spanish government’s austerity measures, subsidies for coal production are being removed, and mines are being closed. Production of coal will no doubt shift to cheaper and less safe coal mines in China and Africa, and the miners are being left with no support to build replacement industries. Music and comedy, with a suggested donation of £3. Birmingham Social Centre, Pershore Rd near Pebble Mill Road. For directions and more detail see this blog. We hope that you can make it along to one or more of these events next week – we’ll be reporting from all of them if you can’t so make sure to look back here next week to find out what happened. At 10am on Thursday 12th July outside West Midlands Police HQ, Lloyd House, Colmore Circus, B4 6NQ in Birmingham City Centre. In the UK G4S has been the subject of 700 complaints over the treatment of asylum detainees of which 130 were upheld. G4S has been implicated in the deaths of a number of asylum seekers in its custody; in 2010 G4S lost a Home Office forcible deportation contract after the death of an Angolan deportee, Jimmy Mubenga, while being restrained on a flight back home. 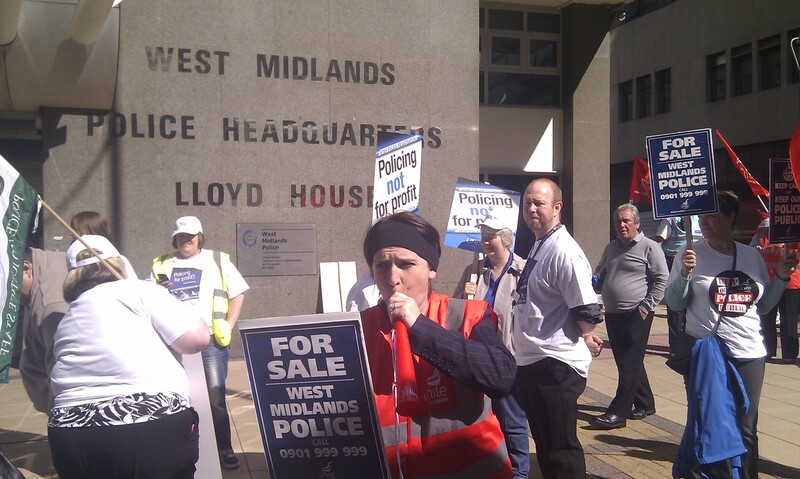 West Midlands Against Policing for Profit is asking people to support the lobby called by UNITE and UNISON and to show solidarity with Police service staff under threat from this privatisation, but also to oppose the corporations bidding to run these critical policing services. Human Rights First! Stop KBR! Stop G4S! West Midlands and Surrey Police forces have announced the shortlist of Companies who will go forward to make an outline proposal under the Business Partnering privatisation programme. The Business Partnering programme is intended to privatise all services that ‘can be legally delegated to the private sector‘ and is being promoted by the Home Office. G4S has numerous contracts with the Home Office to detain and deport asylum seekers, there have been ‘over 700 complaints against G4S over the treatment of detainees of which 130 were upheld. There have been 48 assault complaints. In 2010 G4S lost a Home Office forcible deportation contract after the death of an Angolan deportee, Jimmy Mubenga, while being restrained on a flight back home. KBR is a US construction and defence, logistics and gas company which built Guantanamo Bay. KBR has made massive profits from US wars in Iraq and Afghanistan by providing logistical and infrastructural support to the US occupying forces. According to the UNITE report more than 20 federal lawsuits naming KBR and seeking class-action status were filed in late 2008 and 2009 over the practice of operating “burn pits” at U.S. bases in both Iraq and Afghanistan and thus exposing soldiers to smoke containing dioxin, asbestos and other harmful substances. The meeting decided to extend the procurement timetable for the BPP to enable the new Police Commissioner who is to be elected in November to be involved in the award of the contract. An extra Police Authority meeting is to take place on 12th July to discuss the business case for the BPP proposal and to look at the proposed financial savings. The only note of opposition at the meeting was the formal receipt of UNISON’s petition opposing the privatisation. In a carefully managed meeting the 35 questions submitted by members of the public on the privatisation proposals were not allowed to be put to meeting. Critical information was omitted from the agenda, including the names of the shortlisted bidders who were selected at the Joint Surrey and West Midlands Police Board last Friday. US military-strategic company KBR, a former subsidiary of Halliburton, is understood to have expressed an interest in the contract. KBR has had extensive contracts to service the US military occupation of Iraq and was involved in the construction of the Detention centre at Guantanamo Bay. Investigations by the US Project on Government Oversight have revealed the widespread use of human trafficking and forced labour by KBR’s subcontractors involving migrant workers from Asia who have been taken to work in Iraq.